Judith also did freelance teaching in Tobago at St. Nicolas Primary School, Michael K. Hall Community School, and Elizabeth College. Judith studied with the Institute of Bankers where she was exposed to English Law, Banking, Economics and Accounting, and worked at the Imperial Bank of Commerce’s Head Office, which was formerly located in T&T. Judith is a Music Teacher who prepares students for the Trinity Guildhall Schools of Music & The Royal Schools of Music London Examinations. Oxford University Press recognized her contribution to the Oxford Music Dictionary twenty (20) years ago. As a result, her observations have been incorporated in the current edition of the Oxford Music Dictionary. Apart from teaching in Tobago, Judith assisted with the first National Literacy Survey 1994 and, as a trained ALTA Tutor, started classes in Scarborough for adults who needed this assistance. While in Tobago in 1995, the People's National Movement made a national call for those who had made contributions towards the reforming of the education system. Her suggestions were adopted in the P.N.M. 's Green Paper Report and so acknowledged. Namely: School Book Rental System, Music in Schools making Music compulsory and introducing it into the primary system, and Pan in Schools. While in Tobago, she was the Accountant/Programmer, then Manager of Jen Mar Business Machines. 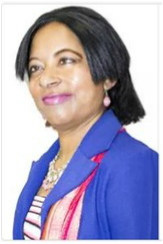 Judith worked at the National Insurance Board NIB Head Office Pensions Department for a number of years, then seconded to the Prime Minister's Office White Hall when Mr. George Chambers was Prime Minister. Upon her return to Trinidad in 1996, Judith noticed the growing number of ‘young men’ who were idle on the Brian Lara Promenade during school hours. Upon investigation, they said that they had ‘dropped out’ for a number of reasons: parents had left for the United States, they were living with a grandparent, they could not afford the school uniform, could not understand the school work, etc. As a result, she combed the area with assistance from a resident of East Port of Spain to find a suitable location for these young men, since most of them were from this marginalized community. It is interesting to note that her family originated from ‘behind the bridge’. Good things have come from this community. As a registered N.G.O. with Community Development Culture and Gender Affairs she attended numerous meetings in and out of the community for the development of the area (most never came to fruition), yet she pressed on, housing the school in the St. Paul Street Multipurpose Facility after approval from the Ministry of Sport was given (at a cost) in September 1998. Students came from all over the country, since the universal complaint was lack of teachers. However, recognizing that a Learning Disability or a Reading Disorder was part of the absenteeism rate, the School Board, with Judith as its President, approached the Rotary Club of Port of Spain, who assisted in bringing a Special Education Adviser. This said adviser was introduced to the then President George Maxwell Richards. The President lamented in 2004 that “in his estimation, 10,000 children were missing from the education system.” Judith wrote to him, indicating that some of them were at Paideuo, after which he visited and gave a sterling speech. Over the years, along with the School Board, Judith did interviews, wrote letters and funding proposals to get money to keep the ‘school doors open’, but was never able to pay herself or her staff a salary, only a stipend. However, she did receive donations from National Petroleum NP, Amoco, Rotary Club of Port of Spain, Peztex Ltd, Metal X Engineering, Canadian Women's Club, Canadian Executive Services Association, British Gas, Royal Bank, Republic Bank, Newsday Street Children Fund, President Carnival Fund, Sagicor, Climate Control and individuals. As Principal and President of the School Board, Judith sought and acquired funding from the Canadian High Commission for Grant Funding in 2001. After the first ten (10) years, over three hundred (300) children were assisted, and a booklet with Statistics of this pilot project was documented by the School Board. Adult Literacy Tutors Association ALTA - Trained 1994 Librarian 1996, 1997, 1998. Missionary/ Evangelist - Biblical Studies, Prophetic Studies (traveled to over twelve (12) countries with two (2) videos on youtube.com titled Missionary Mannequin). Mediation/Counseling as needed by Paideuo, since the Principal is called on to appear in/out of court proceedings representing children of Paideuo - giving updates to the court of their attendance since being sent to the school. Help members of the community fill out forms for ID Card/Passport, prepare CVs, Job Applications etc. Assist others wanting to get N.G.O. registered, walking them through the process. Prayer Group for the community of Santa Cruz and the nation as a whole. Born Judith Anne Marie de Verteuil, Rodney Street, East Dry River, Port of Spain, on January 22nd, 1961, one year before Trinidad and Tobago got its Independence from the British. Mother of two (2) boys. One born in Tobago, the other in Trinidad. Daughter of Evangeline (Walters) de Verteuil (from St Vincent), a Teacher (deceased), and Selwyn de Verteuil (Trinidadian), an Accountant (deceased). Attended Nelson Street Girls RC School, Port of Spain, then St. Dominic's Convent School, Malick Barataria, graduating in 1978 with a full certificate from Cambridge/London Certificates. Studied Music at Trinity College of Music, London, and Royal Schools of Music, London, England. Institute of Bankers - English Law, Elements of Banking, Accounts and Economics. Biblical Studies - New Jerusalem Ministries, Trinidad ,W.I., 1998. Dyslexic Association - V/V Training 2012. Other short courses relevant to the above. “Music is an ﻿art worth learning,” is one o﻿f her quotable quotes, since Judith also writes poetry.